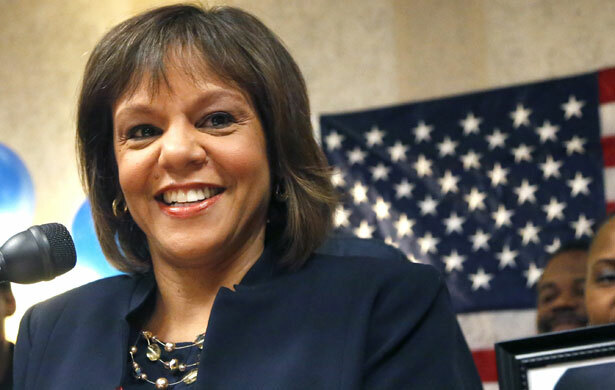 Robin Kelly's resounding victory in Illinois' special election for US House is a blow to pro-gun hawks nationwide. Robin Kelly, who as a young state representative sponsored gun-safety legislation with state Senator Barack Obama, swept to victory Tuesday night in an Illinois US House primary that sent a powerful signal about the National Rifle Association’s dwindling influence within the Democratic Party. Kelly won 58 percent of the vote in a crowded field, easily defeating former Congresswoman Debbie Halvorson and other Democrats to win the nomination to replace former Congressman Jesse Jackson, Jr., as the representative from Illinois’s 2nd district. In a multiracial district that includes parts of Chicago, as well as suburbs and rural regions of a district that stretches across northeastern Illinois, Halvorson began the race as the front runner. In addition to her status as a former House member, she was the only white candidate in a field where the African-American vote was divided among more than a dozen contenders. After the Newtown, Connecticut, shootings focused the attention of the country—and Illinois—on the gun debate, however, Kelly made support for gun-safety legislation central to her campaign. Kelly’s “Help Me Fight Gun Violence” message united African-American and progressive white voters against Halvorson, who had accepted NRA support in previous races and who continued to support NRA positions on many issues. Though President Obama, who has made te fight for gun-safety legislation a priority of his second term, stayed out of the race, Kelly promised to champion legislation backed by the president—who her ads noted she had worked with a decade ago, when they both served in the Illinois legislature. The Illinois Rifle Association, an NRA affiliate, backed Halvorson with late-stage mailings. But it was Kelly’s steady focus on the gun debate that gained her the upper hand in the race. The NRA and its apologists will, of course, claim that the Illinois district was a bad battleground for the group and its message. Illinois is not West Virginia or North Dakota, after all. And the Chicago area has bitter experience with gun violence, as Kelly noted in a campaign that focused on the anger and pain felt in neighborhoods where too many young lives have been lost to shootings. But advocates for tougher gun laws recognized the significance of the Illinois result. 5. Support laws that prohibit conceal-and-carry permits. Primary voters in the 2nd district of Illinois spoke with that united voice Tuesday. And they said “no” to the NRA. Loudly. Perhaps so loudly that Democrats in Congress, many of whom have been cautious gun-safety advocates, will help Robin Kelly fight gun violence. Why won't Rahm Emanuel apologize for police brutality in Chicago? Read Flint Taylor's take.